Lebron isn't the GM and even with AD they'd still get swept by the Warriors. I don't know why people think anybody can beat GSW this season. Barring catastrophic injury they are unbeatable. Unless they get him this off season for less. IE, the boston deal isn't real (would you trust Danny Ainge? hell f'ing no). Maybe Lebron is playing 4D chess. He won his Cleveland title and feels that's enough to argue GOAT status or top 3. Or maybe it was the '14 Finals vs the Spurs?? Or last year vs the Warriors when JR Smith got the rebound?? One of them shits gave him the aneurysm..
Maybe Giannis not having a jump shot is like BP not wanting long range projectiles in his suit??? Or are we reed richard's reaching with that? Whereas I get what your saying, I think it's one of those situations Where you don't want to make it appear that T'Challa I'd only able to do this much because he had a 10k advantage and if it weren't the case he wouldn't be as good. If Lebron just played like half his normal self in '11 he would have 4 rings. Dwyane Wade was the best player in that series. We all know Bronchiole was dealing with off the court stuff but let's not get into that Storm ish. nope. he's one of many geniuses (not even the only one in his family) but with his own special flair. 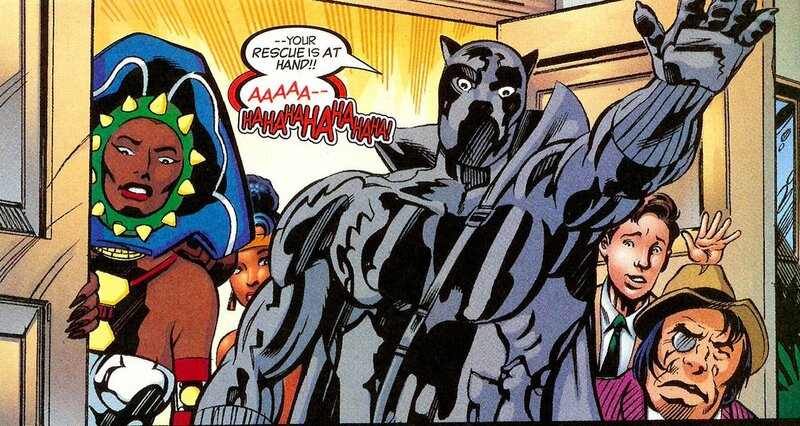 Wakanda was badass before he was born and it will be badass after he dies. Last edited by Redjack; 02-08-2019 at 06:27 PM. My bro, Wakanda was technologically advanced thousands of years before T'Challa's birth. There would be no T'Challa without Wakanda and to be quite Frank, T'Challa as written over the last few years, has been responsible for Wakanda's deterioration and diminishment all the way from AvX straight through to Hickman's Time Runs Out? All of the previous Black Panthers dating back to Bashenga, fought for and defended Wakanda for millenia thus insuring that there was an unbroken line of excellence on all levels scientific and spiritual. T'Challa post Hudlin, has been many things but describing him as being greater than all the BP's that preceded him, is a breach. That is one of the downsides of Hudlins version of Wakanda's history. T'Challa went from the person who elevated Wakanda to what it is today, to just being one link in a very long chain of leaders. Good for Wakanda and arguably good for the greater mythos as a whole, but it quite frankly makes T'Challa less special.